. : Optics & Photonics Focus :: Listen to the Light and See Deeper :. A photo-acoustic image. In vivo Multi Spectral Opto-acoustic Tomography (MSOT) image of a section of an adult zebrafish that expresses the fluorescent protein mCherry in its brain. Every individual is a storehouse of knowledge, acquired through the relentless efforts of one’s ears and eyes. But can the simple act of listening help you see better? This is, indeed, what Daniel Razansky and coworkers at the Institute for Biological and Medical Imaging, Munich, Germany, together with researchers at Massachusetts General Hospital, Harvard Medical School and Howard Hughes Medical Institute, USA, have accomplished. They have imaged fluorescent proteins deep within biological samples, not visible by existing means, by listening to the sound produced by light interacting with them. It was Alexander Graham Bell, by some accredited for inventing the telephone, who in 1880 coined the phrase "listening to the light". He showed that thin discs emitted sound when a periodically pulsed beam of sunlight was impinging on them. The sample absorbs a portion of the light, heats up, and expands a tiny bit. With a periodic train of light pulses, the material passes through periodic contraction and expansion cycles, which results in vibration and, therefore, in the generation of acoustic waves. This effect is now known as the photo-acoustic effect. Razansky and coworkers have now used such photo-acoustic signals, instead of light-scattering signals, to image fluorescent proteins from very deep and highly diffusive tissue samples. In particular, they acquired images of fluorescent proteins with the photo-acoustic effect. Fluorescent proteins are increasingly being used not just as intrinsic and non-invasive labels in biological samples, but also — and perhaps more importantly — as reporters of gene expression. Use of fluorescent proteins heralded a new era in biomedical research and many fundamental biological discoveries have been made thanks to these novel biological fluorescent markers. Photo-acoustic sectioning. Five transverse opto-acoustic imaging slices through the hindbrain area at the level of crista cerebellaris of a living zebrafish. Imaging any fluorescent marker has been traditionally done through the use of fluorescence microscopy. Light in the blue highly-energetic end of the spectrum is shined onto the biological sample. The fluorescent marker absorbs this light, dissipates some of its energy and gives out light with slightly longer wavelength and lower energy, known as fluorescence. The fluorescence wavelength is characteristic of the fluorescent marker and can be used to localize where it is in the biological sample. Fluorescence microscopy is a very effective tool in thin samples like single-celled organisms. However, with slightly thicker samples it becomes difficult to know from where exactly the fluorescence comes from. Things improved with the adoption of advanced techniques such as confocal fluorescence microscopy and multiphoton microscopy. Even then, it was seldom possible to image deeper than 1mm in transparent samples and matters were even worse using diffuse samples. As the biologists graduated from single-celled organisms to more and more complex organisms, like Zebra fish, it was becoming increasingly important to image deeper and deeper keeping their samples alive and without having to slice them. "The problem however is that, when imaging with light through thicker and thicker tissue, photons start interfering more and more with cellular interfaces and organelles leading to multiple scattering events within the specimen under investigation," points out Razansky. "The detected light therefore loses information on its origin and propagation path, blurring the images and destroying spatial resolution." Other techniques like Fluorescence Molecular Tomography (FMT), and Diffuse Optical Tomography (DOT), which utilize complex mathematical models of photon propagation in tissues, did arrive on the scene to improve the situation. 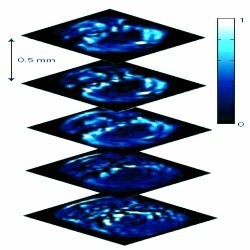 "These techniques could image deeper than 1cm into the sample but offers low spatial resolution, only on the order of 1mm and have the additional drawback of very long image acquisition and reconstruction times," remarks Razansky. What was required was a complete change in the paradigm to bring about a radical change in the scenario. Whatever the improvement proposed, if based on detecting the emitted photons, it would always be limited by photon scattering. This is where the idea to detect the emitted photo-acoustic signals came up. "The acoustic signals travel through the diffuse biological media with much less distortion than the fluorescence photons. This method has been in use for some time now for imaging, but primarily for resolving oxy- and deoxy-hemoglobin and different vascular structures," says Razansky. "Our work has shown for the first time that it is possible to effectively resolve genetically expressed agents (fluorescent proteins) deep in intact living animals with both high spatial resolution (around 40μm) and sensitivity. This makes it suitable for attaining higher dynamic contrast in intact tissues and an ideal candidate for both intrinsic and dye-based imaging." The experimental setup used by the group consists of a transparent tank. A whole organism, such as a Zebra Fish, can be conveniently fixed inside the tank, on a rotation stage, submerged in water. Water actually facilitates detection of acoustic signals since they travel better in water than air. Nanosecond pulsed laser light is focused as a line into the sample using a cylindrical lens and a broadband ultrasonic transducer — which is aligned inside the tank — detects the generated opto-acoustic signals. A two dimensional image is created by rotating the sample 360 degrees and this image can be extended to 3 dimensions by repeating the process in different focal planes. The problem, however, with this technique is that when performed using a single wavelength the acoustic signals generated from the back-ground reduces the contrast. 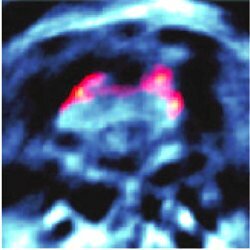 This problem is solved by repeating the imaging processes using multiple wavelengths and subsequently processing them using a mathematical algorithm to extract the desired image information. Each fluorescent protein has a specific absorption spectrum, which is different, but usually close to that of the background structures. This means that the photo-acoustic signature has a wavelength dependence but it is difficult to differentiate it from the background if only one wavelength is used. However, when the imaging process is repeated using a number of wavelengths it gets easier to identify a pattern in the photo-acoustic signature; this pattern differentiates the fluorescent protein from the background. This whole process is called Multi Spectral Opto-acoustic Tomography (MSOT) and is the novelty of this work. "Multi-wavelength illumination offers the possibility to effectively resolve certain biomarkers and other chromophores of interest, having distinct spectral characteristics, over the background absorption. It can also simultaneously resolve multiple markers," explains Razansky. "In this way, fluorescent proteins, dyes and other chromophores and fluorochromes are imaged using our optoacoustic method." "With penetration of about 1-2cm this technique can be applied to certain conveniently accessible areas in humans," foresees Razansky. "In certain cases of low absorption, it can of course cover the entire organ, e.g. photo-acosutics has already provided images of the whole breast. The technique could benefit many areas of biology and medicine, developmental biology, genetics, neuroscience, cardiovascular, cancer research, drug development, early diagnosis, all the usual applications of molecular imaging." We can certainly look forward to novel applications of this technique. At the very least, it clearly tells us how a simple thing such as listening can show us so much. Daniel Razansky, Martin Distel, Claudio Vinegoni, Rui Ma, Norbert Perrimon, Reinhard W. Köster & Vasilis Ntziachristos, Multispectral opto-acoustic tomography of deep-seated ﬂuorescent proteins in vivo, Nature Photonics (2009) 3, 412-417 (link).